Hi François-Marie Arouet (agsob tawagon nga Voltaire) usa nga Franses nga pilosopo. Natawo hiya han 1694 ngan namatay han 1778. ↑ Dates of the first performance, unless otherwise noted. Garreau, Joseph E. (1984). "Voltaire", vol. 5, pp. 113–117, in McGraw-Hill Encyclopedia of World Drama, Stanley Hochman, editor in chief. New York: McGraw-Hill. ISBN 9780070791695. ↑ Liu, Wu-Chi (1953). "The Original Orphan of China". Comparative Literature 5 (3): 206–207. JSTOR 1768912. ↑ This is an adaptation of the famous Chinese play The Orphan of Zhao, based on historical events in the Spring and Autumn period. ↑ "HugeDomains.com - Voltaire-Integral.com is for Sale". Voltaire-Integral. Ginkuhà 2014-06-06. App, Urs. The Birth of Orientalism. Philadelphia: University of Pennsylvania Press, 2010 (hardcover, ISBN 978-0-8122-4261-4); contains a 60-page chapter (pp. 15–76) on Voltaire as a pioneer of Indomania and his use of fake Indian texts in anti-Christian propaganda. Durant, Will, The Story of Civilization. Vol. IX: The Age of Voltaire. New York: Simon and Schuster, 1965. Gay, Peter, Voltaire's Politics, The Poet as Realist, Yale University, 1988. McElroy, Wendy (2008). 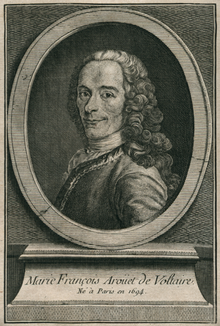 "Voltaire (1694–1778)". In Hamowy, Ronald. The Encyclopedia of Libertarianism. Thousand Oaks, CA: SAGE; Cato Institute. pp. 521–2. ISBN 978-1-4129-6580-4. OCLC 750831024. http://books.google.com/books?id=yxNgXs3TkJYC. Schwarzbach, Bertram Eugene, Voltaire's Old Testament Criticism, Librairie Droz, Geneva, 1971. Torrey, Norman L., The Spirit of Voltaire, Columbia University Press, 1938. Vernon, Thomas S. (1989). "Chapter V: Voltaire". Great Infidels. M & M Pr. ISBN 0-943099-05-6. http://www.positiveatheism.org/hist/voltvern.htm. Wade, Ira O. (1967). Studies on Voltaire. New York: Russell & Russell. Wright, Charles Henry Conrad, A History of French Literature, Oxford University Press, 1912. "The Cambridge Companion to Voltaire", ed by Nicholas Cronk, 2009. Pomeau, René La Religion de Voltaire, Librairie Nizet, Paris, 1974. Wikisource has the text of the 1911 Encyclopædia Britannica article Voltaire. Hewett, Caspar J. M. (August 2006). "The Great Debate: Life of Voltaire.". Ginkuhà 2 November 2008. Ini nga pakli kataposan nga ginliwat dida han 19:35, 3 Pebrero 2019.